French double manual harpsichord built by Earl Russell (Oberlin, 2000) after Henri Hemsch (Paris, c. 1734). The original is housed at the Museum of Fine Arts in Boston, Massachusetts. Its disposition is two eight foot registers and one four foot register with a shove coupler, and includes a buff stop. The compass is five octaves, FF-f'''. 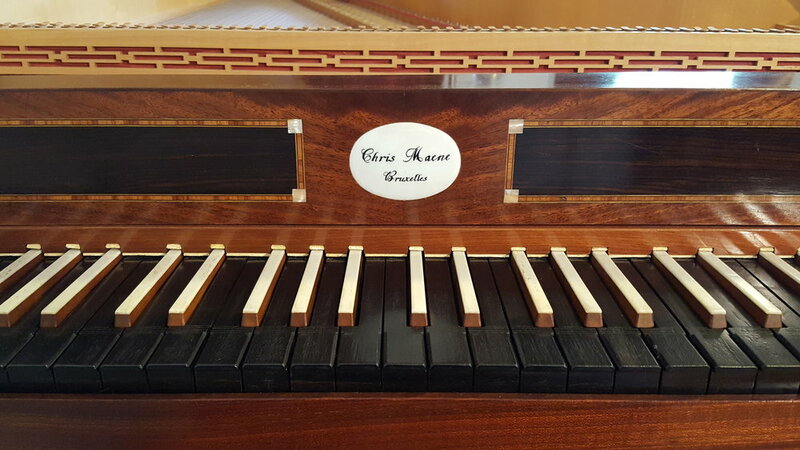 Viennese fortepiano by Chris Maene (Brussels, 1995) after Anton Walter (Vienna, 1795). The original is housed at the German History Museum in Nuremburg, Germany. It has knee-levers for raising the dampers and engaging the moderator, which slides a thin strip of cloth between the hammers and strings to create a muted effect. The compass is five octaves, FF-f'''. 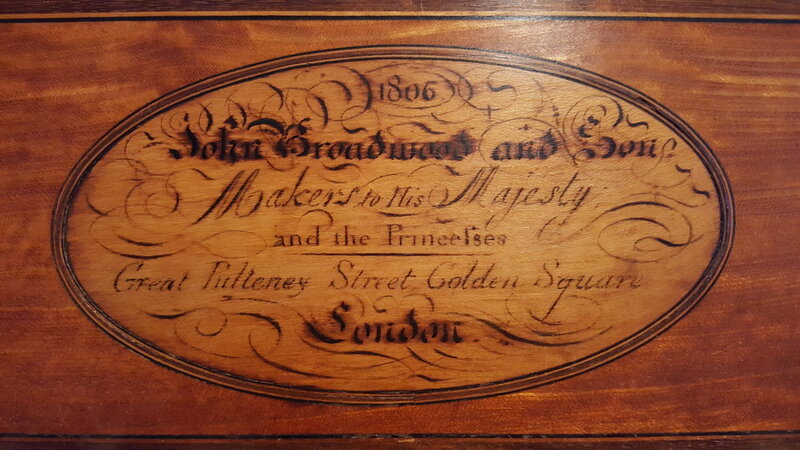 English grand piano by John Broadwood and Son (London, 1806, maker's number #3448) restored by Dale Munschy in 2011. This is one of the first grand pianos Broadwood built with a “split-damping” system that allows the player to undamp either the treble or the bass independently while leaving the other side damped. The pedal on the right lifts the treble dampers from Middle C up, and the middle pedal lifts them from Middle B down. In order to “undamp” the whole piano, one must depress these two pedals at once. Later models revised this system so that a single pedal on the right is split in half, which allows for ease in undamping the whole piano, but still leaves the option for “split damping.” The pedal on the far left shifts the action to the right to provide options for both una and due corda - one string or two strings. The compass is five and a half octaves, FF-c''''. This piano was featured in Ernest Closson's History of the Piano, first published in 1944. Seventeenth century Italian virginal by Zuckermann (unknown builder, 1973) restored by Dale Munschy in 2015. The compass is four octaves, C-e''' with a GG/BB-e''' short octave. Square piano by Charles May (London, c. 1785-1800) restored by Dale Munschy in 2016. The square piano can be played with the lid either open or closed, and features two separate folding music desks; one that unfolds from the top of the lid in the closed position; and one that unfolds from inside of the instrument when the lid is open. Like many square pianos from this period, this instrument employs a “split-damping” system that allows the player to undamp either the treble or the bass independently while leaving the other side damped. The hand stop on the right lifts the dampers from Middle B down, and the left hand stop lifts them from Middle C up. In order to “undamp” the whole piano, one must engage both left and right hand stops. The middle hand stop is a "lute" stop that produces a pizzicato effect, comparable to a buff stop on a harpsichord.